Hag Fen is a marshland area in eastern Glenumbra, northeast of Aldcroft. The Bloodthorn Cult have set up operations in the south of the marsh around Tangle Rock. They have struck up a deal with the hag coven in the northern fens to launch joint assaults on the Beldama Wyrd. 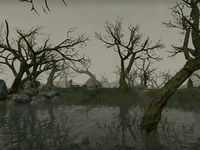 Hag Fen Objective: Uncover the dark secrets of the Hag Fen. Due to the large area covered by Hag Fen, the area includes two wayshrines. 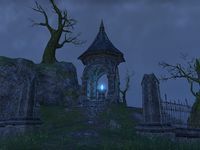 Hag Fen Wayshrine is located on the eastern coast of the fens, just west of Mesanthano's Tower. 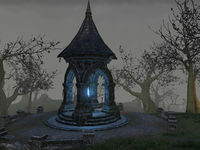 North Hag Fen Wayshrine is located at the northern end of the marshes, west of Spindleclutch and below Dwynnarth Ruins.